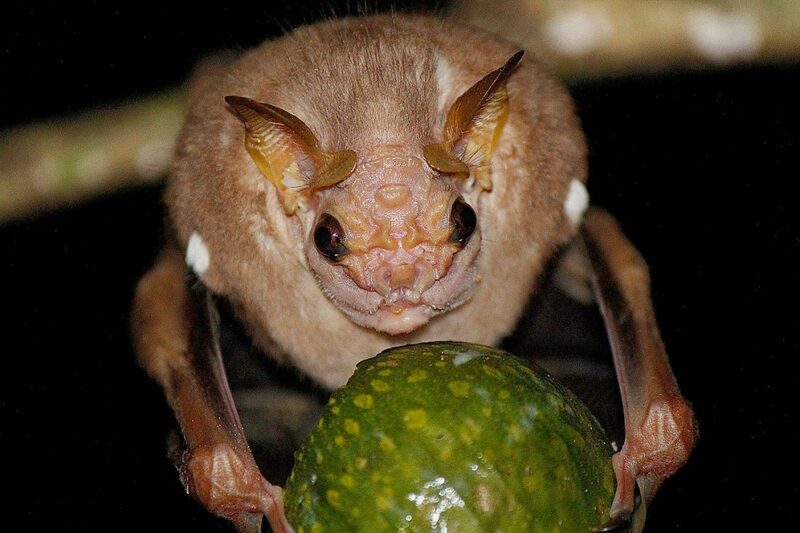 There are more than 114 species of bats, and around 80 of these can be found in the Osa Peninsula. Some are so common that they practically live in our houses, while others are so difficult to spot that when you encounter one, you are caught off guard and can’t help but think that no animal more incredible exists. It is said that the Osa contains more species of bats than the rest of Costa Rica, and I believe it to be true, because it has the best sites and resources. If I were a bat, I would of course choose to stay in the Osa. But the bat that has always had my attention is called the wrinkle-face bat, or the “old bat.” One night I was working late at Osa Conservation Biological Station. It had rained for the first two hours of the night, and typically after such a rain many animals come out, especially the bats. Walking the coyunda river toward my house, there is a guava branch about three meters above the water. While searching for snakes and frogs there with my flashlight, I saw two eyes that didn’t belong to a frog, much less a snake. I approached very slowly as to not scare the animal, but in truth I was more scared of it than it was of me. I stayed with the bat for what felt like hours, watching how it ate a fichus fruit. It was a truly incredible experience: to think we have such beautiful and surprising animals in the Osa! I couldn’t wait for the excitement of successfully identifying the species, and I returned to the station to ask bat researcher Gloriana Chaverri, who happened to be staying with us at the time. Of course, she already knew the species from her years of work with bats. That was the only night I have seen the wrinkle-face bat in this giant forest, but the Osa continues to surprise me every day!